In a move that we’re still only half-convinced isn’t an elaborate troll, the University recently unveiled a completely redesigned “systemwide identifier” for itself. You’ve already heard our initial reactions to the new logo, but here is some further explanation behind (and outrage against) this change. University of Fisher-Price Toys, really. The cyan-and-yellow design is (somehow) modeled after the current book-and-crest seal, a boldly simple, modern nod to Silicon-Valley chic. According to the University, the redesign won’t replace the UC logo entirely, but is part of an initiative under the broader campaign Onward California. The new design, then, appears more intended to be a friendlier visual supplement, versus a complete overhaul of UC identity. According to Vanessa Correa, Creative Director at the University of California, the reworked design “is less of a rebranding exercise, but instead the creation of a coherent, consistent, and relevant brand identity where before there was none.” Some fancy tricks in Adobe Illustrator might indeed read “relevant” and modern, we must admit. But we’re thoroughly disappointed with this blob. It looks like a blue toilet flushing. 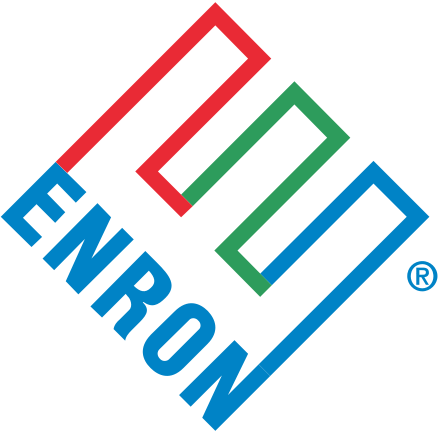 Remember when, a long time ago, there was this company called Enron? Remember that this company, Enron, was a giant among men in the energy business? Remember when Enron pretty much screwed over its employees, investors and the state of California in 2001? Yeah, the University of California still wants its money back. How much? Well, the university lost about $145 million. UC is appealing all the way to the U.S. Supreme Court in a battle against three banks tied with the whole Enron fiasco. The university is the lead plaintiff in the case against Merrill Lynch, Barclays and Credit Suisse First Boston. There are about 50,000 other plaintiffs also in the case. But why only these three banks? Weren’t there other banks? According to UC spokesperson Trey Davis, some of the other banks have settled outside of court to the tune of about $7 billion. Still UC and the other plaintiffs say that the banks were also responsible and knew of Enron’s shadiness and didn’t do anything to stop the energy giant. We’re not legal scholars, so we really don’t know if the highest court will take this up and if they do, whether or not they will favor on the side of UC and the other plaintiffs. Our guess, the Supreme Court won’t hear the case. But that’s just our guess. We’re actually really hoping that this goes to the Supreme Court. It’d be nice to get some of that money back.